Nikita Krylov Defeats Ovince Saint Preux Via Rear Naked Choke! The Light Heavyweight match between the former FNG 205-pound king Nikita “The Miner” Krylov and von Flue choke expert Ovince “OSP” Saint Preux kicks off the main card of UFC 236 PPV (pay-per-view) event tonight (Saturday, April 13, 2019). The fight is happening now inside State Farm Arena in Atlanta, Georgia. The two already squared off at UFC 171, on March 15, 2014, when Saint Preux forced Krylov to tap out in the first round. The referee in charge for this contest is Blake Grice. The battle begins! Fighters touch gloves. It seems both are cautious, Krylov opens up with a middle kick. Good punches Krylov, great combo, the referee warns Saint Preux not to use fingers. Good combo Krylov, but now great takedown Saint Preux. 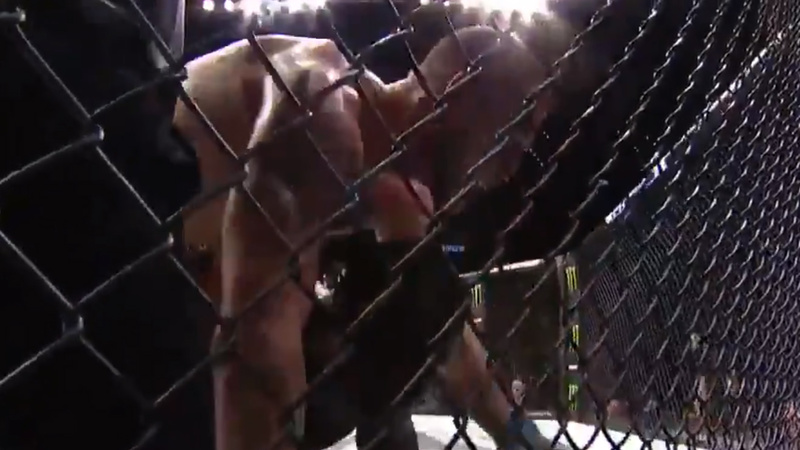 It seems Krylov made to get up, now both fighters are against the fence. Short punches Saint Preux. Krylov grabs him into a guillotine choke, bad idea, he changes his opinion. Krylov releases guillotine, but he gets up again, both fighters against the fence. Krylov makes a great reversal, now Saint Preux is against the fence. Krylov has left underhook. Oh, what a takedown by Saint Preux, amazing trip. Krylov got up immediately, but he has a big problem, Ovince’s arms are locked around his body. Krylov is pressed against the fence. The crowd starts to boo. Wow, Krylov takes his rival down, but Saint Preux rotates from the side mount, ends up in the full guard. Short elbows Saint Preux. Krylov tries to rotate, Ovince goes to the side mount, and now full mount. Strong elbow Ovince, Krylov is in big trouble. Nikita survives and he is in the stand-up again. Big knees Krylov, and a superb right hand. What a battle! Fighters continue trading shots in the stand-up, middle kick Krylov, followed by a right hand. Fighters clinched up, Ovince is at the fence, and now Nikita stomps his feet, pressing him against the fence. Short punches Krylov. Great left hands to the mid-section, and this was a strong punch, missed by a hair. The end of the round, I think 10-9 Ovince Saint Preux. Saint Preux’s corner insists on keeping his hands up and moving the fight to the ground. Krylov feints low kick. Now sends one. Big right hand Ovince. Jab to the body Krylov, middle kick Ovince just missed. Question mark kick Krylov, amazing punch Krylov, but Ovince changes the pace of the game and attempts a takedown. Ovince tries to trip his rival, but gives up and delivers few short elbows. Good reversal Krylov, and now superb body lock takedown. Krylov ends up in the mount, he has both hooks in. Nikita controls his back, lands short punches off the top. Wow, Ovince is in big trouble, and now an illegal blow to the back of the head, the referee warns Krylov. This could be dangerous, Krylov controls his neck. Ovince Saint Preux taps out, the fight is over. Nikita Krylov chokes out Ovince Saint Preux!!! It was a great rear naked choke! Nikita Krylov improves the score to 25-6 MMA, 7-4 UFC, Ovince Saint Preux drops to 23-13 MMA, 11-7 UFC.